I’m tweeting the entire text of one of my most popular ebooks at @zapmypaper! And, to celebrate the event, Take Control is even offering the book at 30% off. Here’s the strange but true story. This ebook is geared toward Mac users who want to decrease the amount of paper in their lives. (I do talk about mobile devices too, including not only iOS devices such as iPhones and iPads but also Android and Blackberry products. But I don’t cover Windows for the simple reason that the vast majority of readers in the Take Control audience are Mac users. If there’s sufficient demand, that could change in the future.) 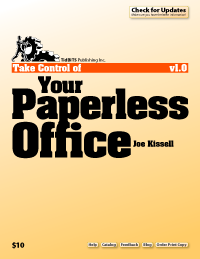 The book discusses not only scanning and optical character recognition (OCR) but also a wide range of other topics relating to the paperless lifestyle—paperless billing and payments, reducing paper junk mail, avoiding the need to print, signing documents digitally, faxing without a fax machine, and much more. And, in the months since its publication it’s turned out to be one of the fastest selling titles in the series. In my ebook I explain how you can scan paper documents and then recycle or shred the originals. But how do you shred an ebook? It’s easy: rip it into 140-character strips and feed it to Twitter! The idea to do this came up during a conversation I had with Take Control publisher Adam Engst and series editor-in-chief Tonya Engst. With the full blessings and support of the publisher, I decided to give this little experiment a try, even though it amounts to giving away the entire text of the book for free. We figured that even though it would be possible for anyone to read the entire ebook via Twitter, most people who found out about the ebook by way of this project and found it interesting would opt to buy a copy, thus getting the vastly improved readability of a proper book layout—not to mention access to future upgrades. And, we figured that whatever publicity we gained from this off-the-wall undertaking would draw attention not only to this particular book but to the Take Control series as a whole. To make the project even more interesting, Take Control is generously offering a 30% discount on the book to everyone who follows it on Twitter! Ideally, I’d like to refrain from sending manual tweets, @replies, and retweets from the @zapmypaper account during the period that the book is being tweeted, simply because that’ll keep the stream cleaner and make it easier to follow. However, if I do need to insert any special announcements or other tweets, I’ll use the same == convention at the start so you can tell they’re not part of the book itself. After the entire book has been tweeted, my intention is to continue using the @zapmypaper account for news, suggestions, and questions about maintaining a paperless office, so those who follow that feed can get ongoing support for their paperless habit. If I were tweeting a novel or some other book that contained only plain text to begin with, the process would have been much simpler. But this being a how-to book on a somewhat technical topic, it included lots of elements that don’t directly translate into text. My goal was to preserve as much of the structure of the book as I reasonably could, striking a balance between faithfulness to the original and readability within Twitter. I think I did a reasonably good job at that, although the conversion was slightly lossy—that is, one could reassemble the tweets into a rough approximation of the original book, but a few elements (and a tiny bit of text) wouldn’t come through. For those who are curious, as well as for the geeks who will inevitably write scripts to re-create the book despite my disclaimers, here’s what I did. Tips, Notes, Warnings, etc. : I enclosed the contents in single square brackets, like so: [tip text] (and note that the Twitter version doesn’t distinguish between the different visual styles we used for tips/notes and those we used for “emphatic” paragraphs). Graphics: The book contained a handful of screenshots; I’ve uploaded these separately and embedded links in the text. URLs: I converted nearly all the external links in the book (except for a few very short ones) to bit.ly URLs for compactness. Footnotes: The book had only two footnotes, and for the purpose of this project I relocated their contents into the main body of the text. Character styles: Boldface, italics, colors, special fonts, and other modified character styles are simply gone. Tweet length: Obviously every tweet has to be no more than 140 characters, but I went a bit further to ensure that tweets always break at word boundaries, and never end with, for example, a paragraph mark or bullet character. Also, I discovered that the Python script I use to send the tweets incorrectly counts certain symbols (such as •, ¶, and —) as more than one character, and rather than spend a lot of time trying to rework the script, I opted to simply leave a few extra characters free to accommodate these symbols on lines that contain them. The result is that some of the tweets will appear to be shorter than they strictly need to be. I began by taking the Word file containing the complete text of the book and adapting it, using a series of Find and Replace operations to convert things like headings and sidebars into a format that would make sense in plain text (as described above). Once I’d gotten to the point where the file no longer had any data that was dependent on text styles, I moved it over to BBEdit, whose much more powerful grep-based Find and Replace feature, along with Text Factories that combine multiple text-manipulation actions into a single command, enabled me to do all the remaining conversion. I converted real paragraph breaks to ¶ characters, making the whole book one long line. I then set the window to wrap at 140 characters and did a quick visual scan to look for any line-break issues my automated procedure missed (and there were a number of these). Once I had everything the way I wanted it, I used the Text > Add Line Breaks command to put hard returns back at the end of each line. The result: the entire book as a single text file, formatted to be tweet-friendly, with each line corresponding to a single tweet. To send the tweets, I installed the Python Twitter wrapper and its various dependencies on my Mac, and then found a simple tweet_textfile script contributed by user “cydeweys” to go through a text file line by line, sending each line out sequentially as a tweet at the interval of my choice (which happened to be every 15 minutes). Actually, the tweet_textfile script was a bit old, and used an obsolete Twitter API, so I had to update it to use OAuth, but the basic logic of the script is unchanged. During a test run of the script, I woke up one morning to discover that the tweeting had stalled overnight. Apparently, due to a fleeting outage on Twitter’s side, one post wasn’t acknowledged the way the script expected, and even though it had some built-in error checking, the precise timing of the glitch produced no actual error message and instead resulted in the script hanging indefinitely. I didn’t have the time to think through all the ways the API interactions could fail and update the script to be as robust as it could be, so instead I cheated a bit, by using launchd to periodically poke the Python script. It’s not elegant, but it works. Of course, there was more to it than that; I’m yadda-yadda’ing a bunch of steps such as registering a Twitter application, getting the necessary API keys and whatnot, and loads of testing and bug fixing. But essentially it boiled down to converting the document to plain text, splitting it into 140-character lines, and using a Python script to send out the tweets. Easy.